Tested and approved by picky babies, this elephant ear-shaped pillow is designed to help support baby’s head while riding in a car seat or stroller or while lounging in a swing or bouncer. This pillow was designed to help correct a flat spot my son developed on one side of his head, after other products we tried were uncomfortable and ineffective. This pillow also promotes proper positioning for babies prone to awkward neck slouching, particularly newborns! Choose between two sizes, infant (birth to approximately 12 months) or Toddler (over 12 months) in the dropdown menu. Toddler head supports were created in response to customer requests for a positioning solution for bigger kids. 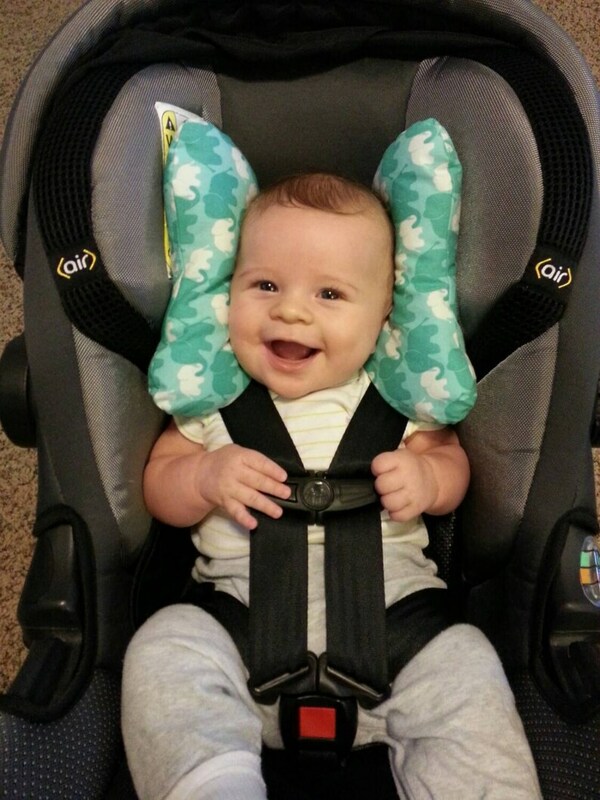 Now your infant can continue using a positioning head support well past their toddler years. These pillows were tested by older children as well as adults, and have proven to be comfortable for all! I’m excited to be able to offer positioning head supports that can be used for all ages, including children who may need continued support past the infant stage due to special needs. -fabric center measures 3.5 by 3.5 inches, and the size of each pillow is 9” by 5”. -fabric center measures 4 by 4 inches, and the size of each pillow is 9.5 by 5.5 inches. In developing the Toddler size head support, I’ve extended the width of the fabric center just enough so that the pillow will fit an adult snugly and comfortably. When comparing the two sizes side by side, the difference may not be visible. When using the pillow, however, the fit of each size will be noticeably different. Ordering one or more head supports as gifts? Add a personalized gift note to your order by adding this listing before checkout! Pillows are sewn from cotton fabric and filled with polyester fiberfill. Make sure to supervise baby during use, as fabrics can pose a suffocation hazard. My daughter has an SCM tumor that could lead to torticollis. She favors turning her head to the left and this pillow helps to prevent that, helping her keep her range of motion. Thank you! This seems to be a great aid for my daughter's torticollis - I hope it works for us! The pillow itself it super cute and I really appreciate how quickly you shipped it out for me.